Forgive me Sheila, for I have sinned. It has been 5 days since my last mug cake blog post. I had a surprise visit from my friend Connor who has been living in Thailand, who came home for two weeks because of the flooding in Bangkok. So exciting! Connor’s visit, not the flooding. Then I went to DC to visit my friend Kaitie who is a fellow Audiology nerd at Gallaudet, and we did the Walk for Hearing this morning. We went to a FANTASTIC concert last night- Jon McLaughlin opened for Stephen Kellogg and the Sixers. I had never heard of them but Kaitie is cool like that and knows fun bands. And now I want to be a Jon McLaughlin biddie. My mom informed me that this blog is not a diary, so I’ll leave the summary at that. 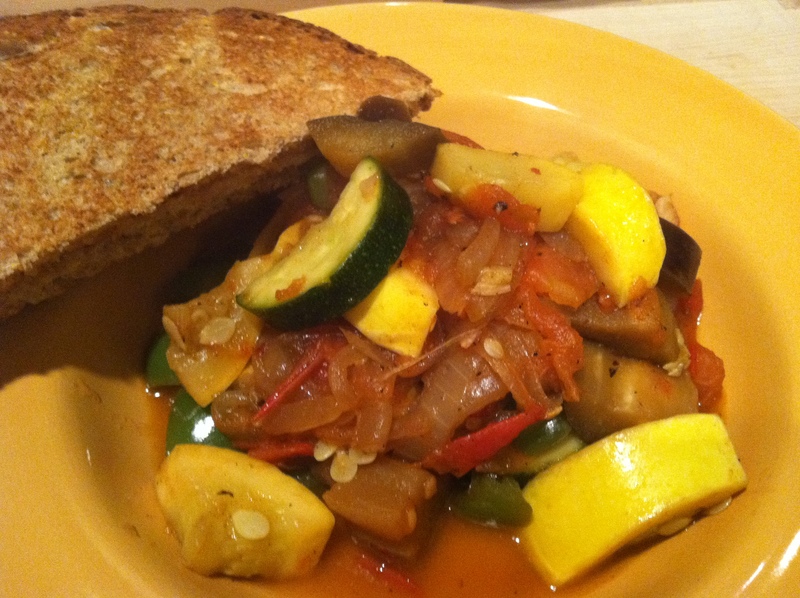 Amy, my and Sheila’s BFF4L, asked me recently if I had ever made ratatouille, so I did a little research and it appears that it’s just a bunch of vegetables thrown together. I did my best. Also I not-so-secretly love the Disney movie, Ratatouille. Clever animal, awkward protagonist, cute unexpected love story, all in a food setting. Animated perfection. In fact, I love all Disney movies just as much as I did when I was in single digits. Especially The Lion King. I swear every time I watch it I think Mufasa might not die. That stampede is so unpredictable. Slice the onion thinly and saute in butter, olive oil, and salt until translucent. Add the garlic and stir for a minute or so. At this point I put a little white wine in to deglaze the pan. 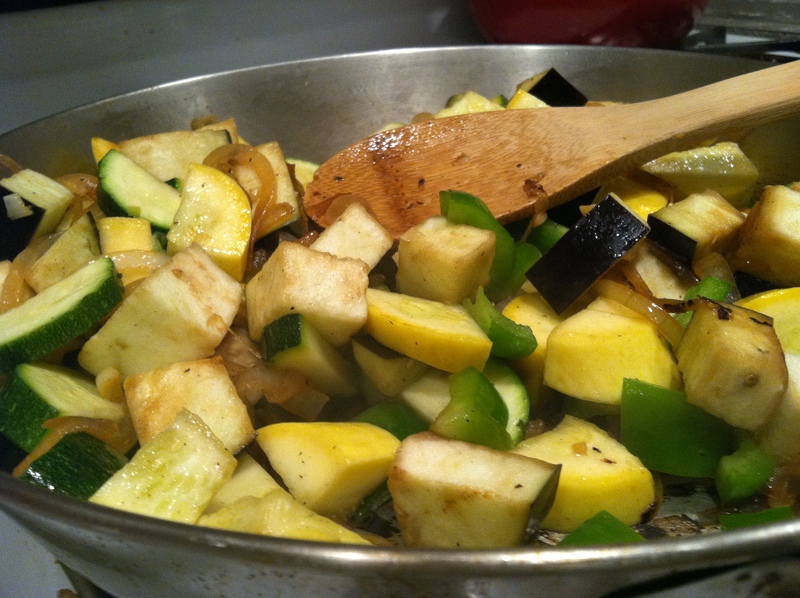 Then I added the eggplant, zucchini, pepper, and squash. Add salt and pepper, then cook until everything is soft. Add a little more white wine if you need to and the red pepper flakes, then throw in the tomatoes. 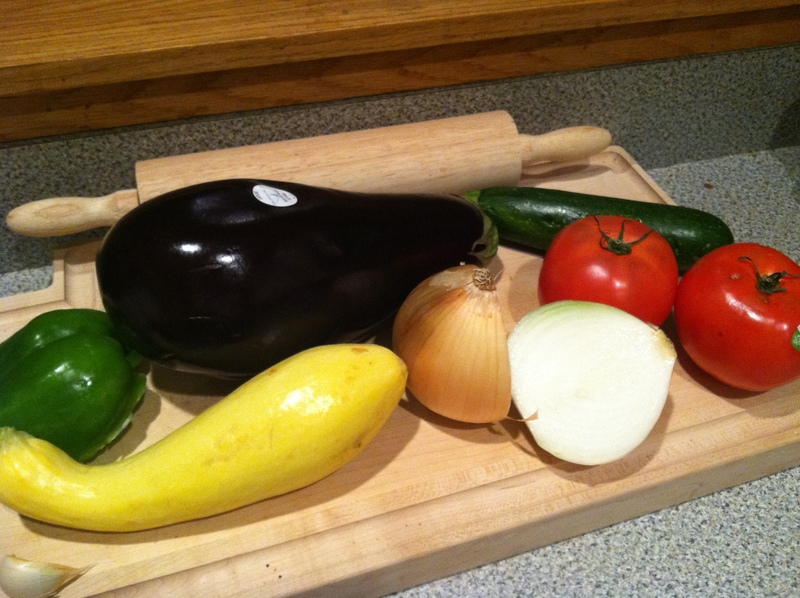 Cook down until it resembles a thick stew or sauce. Serve with bread. If I had thought ahead I would have made my own or gotten some at H&S (best bread ever) but I had to settle for Arnolds 7 Grain. Still yummy. I almost melted cheese on top but then decided it was unnecessary. And now I’ll hemming and hawing over whether I want Aladdin or Dexter to be my “background noise” while I study. Normal decisions.